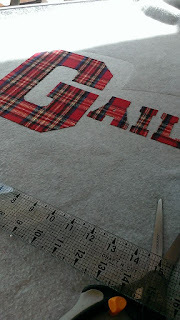 Remember a few weeks ago, I showed you my "Gail" fleece blanket that I made from the Joann Fabrics project page. Well, with two grandkids coming for a visit next week, I made these blankets for them. They are great size blankets and long enough that your toes don't poke out the bottom when snuggled in. 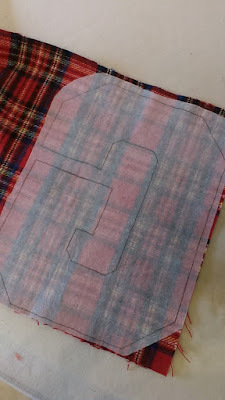 I can't wait for the kids to get here...yippee..
We had a fun afternoon of making this simple pencil case here in the community. We used the craft room which has tables all set up for doing crafty/sewy stuff. I didn't count, but I think we had 10 people do this project. 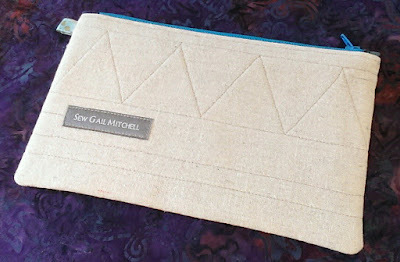 This little pencil case involved some simple sewing, zipper foot work and hand stitching. We were done in 2.5 hours. There was lots of talking going on and everyone loved the tabbed zipper technique. They had not seen that before. So I had lots of hugs and thank you's at the end of the class. Do you think these girls will stop at just making one pencil case? I gave them some brief notes/directions so they could make another one at home. Something tells me I'll be seeing a few more made before the winter is out. Next Tuesday afternoon, at our weekly sewing get together, I'll be showing a few women how to make this little pencil case. They flipped when they saw mine because it reminded them of school. You've seen me make these many times before. These women have visions of making many for their grandkids etc. [been there done that :) ]. Anyway, they thought it would be easier if I made up the kits. I agreed. 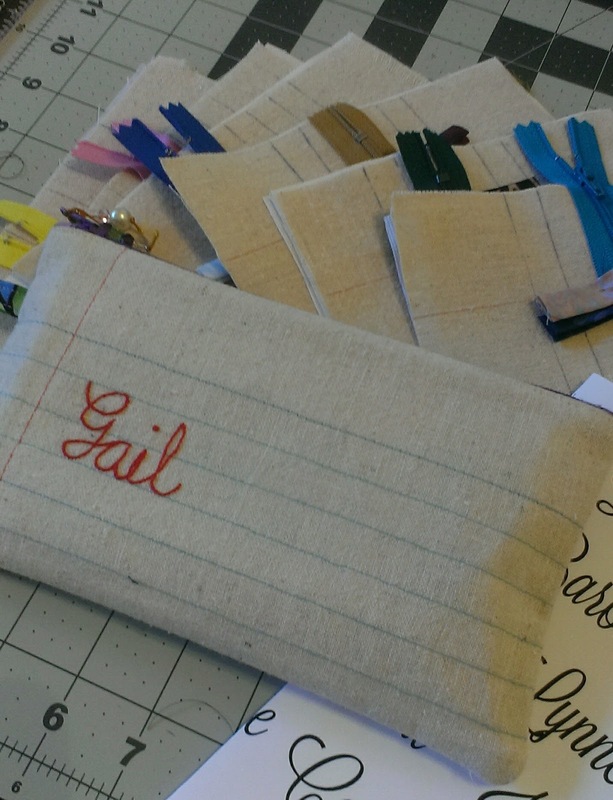 The kits are made and I'm all ready for an afternoon of sewing pencil cases on Tuesday. Are you looking for a quick but cute fleece project. 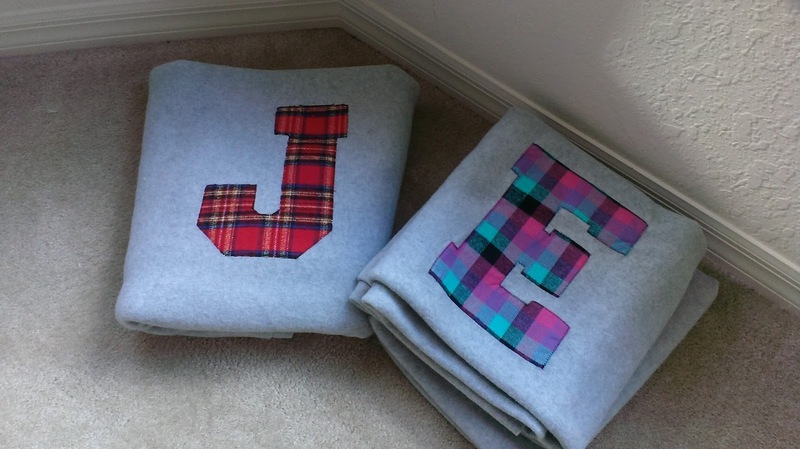 I saw this post on the Joann Fabrics blog on how to make a fleece blanket, accented with a plaid letter. 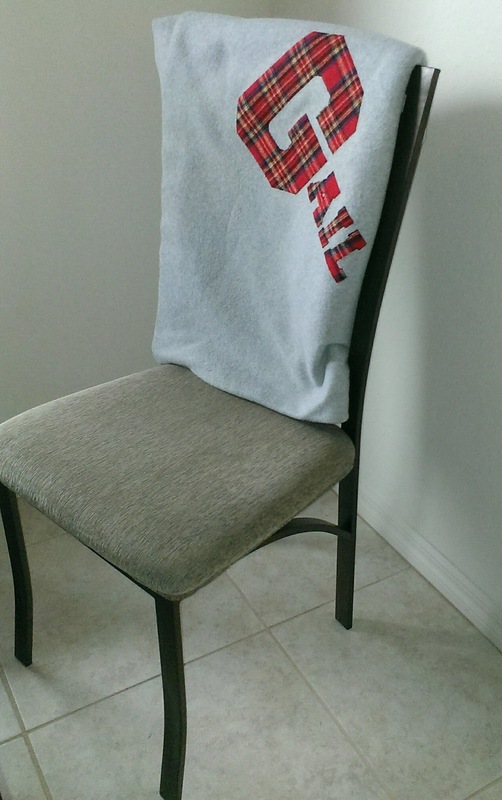 I thought the gray and red colors were really nice. 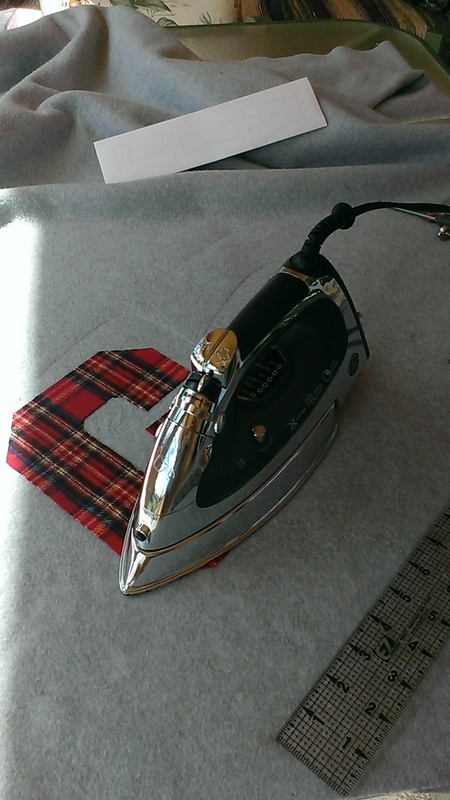 I bought 2 yards of grey fleece and a quarter yard of flannel plaid. 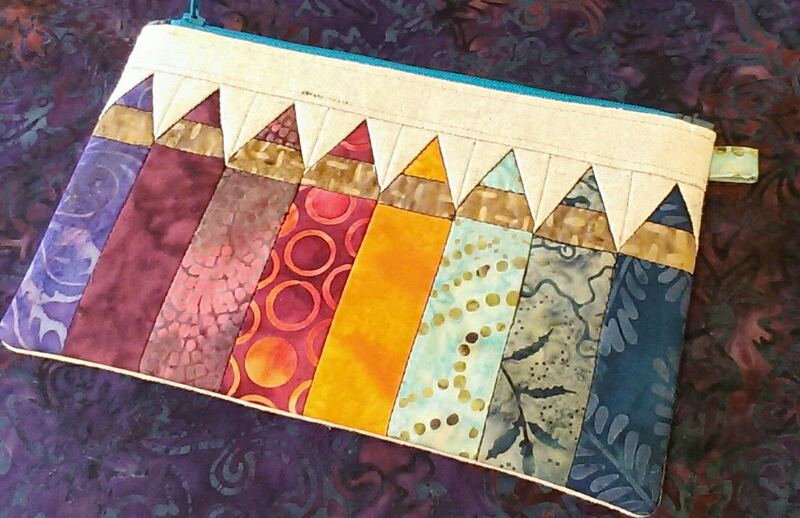 This was a quick finish. I decided to I kept the machine quilting simple on the back. Just in time too. 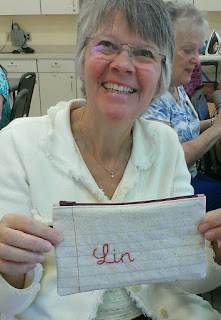 I am going to my sewing group today and I need to return the book to my friend. I did take notes so I can make another. I think it would make a sweet teacher gift, don't you...? I guess I'll have to go out and get a nice set of pencils or markers to keep in it.